This summer, we discussed the techniques and benefits of gravel gardening. 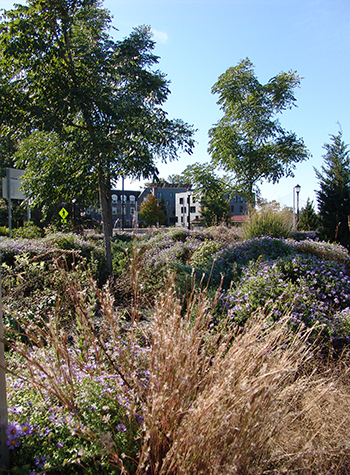 The Scott Arboretum’s experimentation with gravel gardening began with the planting of the Swarthmore Roundabout two years ago. 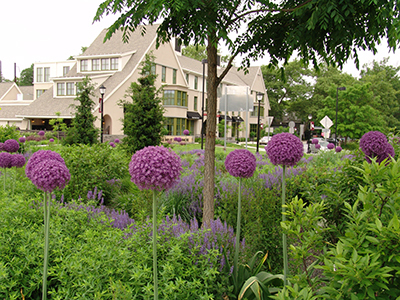 In that short period of time, the garden has matured into a show-stopper that slows traffic down in the circle. 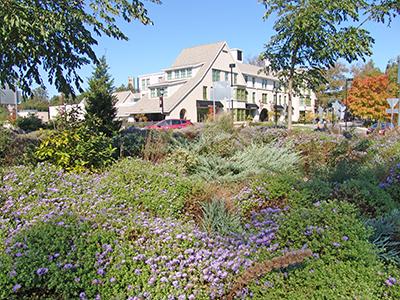 One of PennDot’s requirements for the establishment of this roundabout was to plant evergreen and deciduous trees in the circle. Research has proven that trees in the circle are very effective at slowing people down through the roundabout and reducing accidents. 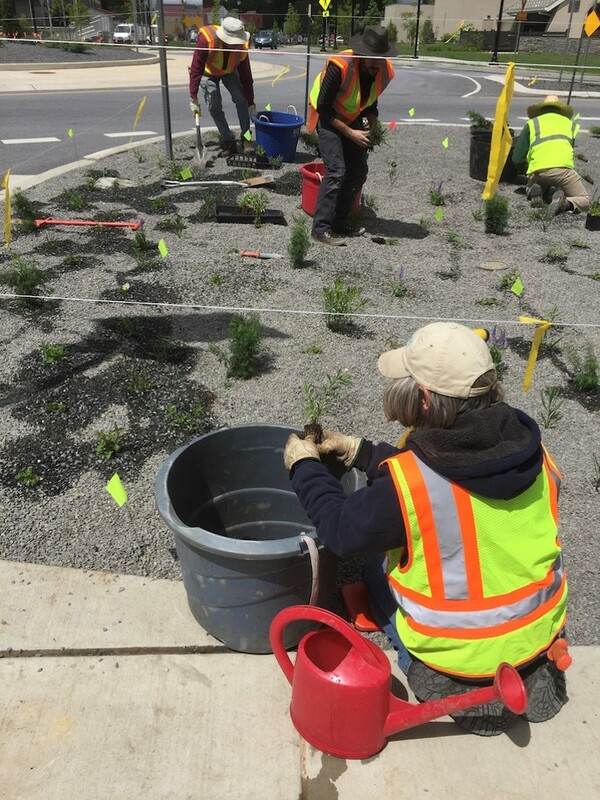 Thus, our first planting in the center of the circle consisted of three Emerald Sentinel TM eastern redcedar, Juniperus virginiana ‘Corcorcor’ and three Espresso TM Kentucky coffeetrees, Gymnocladus dioicus ‘Espresso-JFS’. 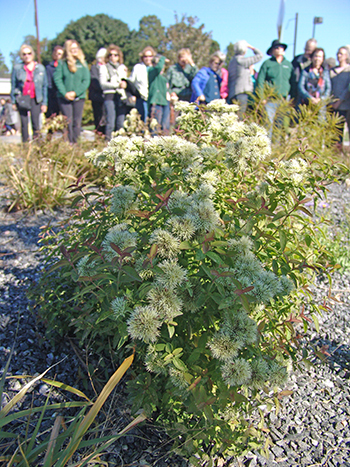 Before the planting could begin, gravel was incorporated into the topsoil in the bed. Because the concept behind this technique is sustainability, we sourced our clean granite gravel locally. The key here was to use the local material, as it is more sustainable and allows our plants to adapt to local conditions. After removing the top 6 inches of soil, 4 inches of gravel was tilled into the soil and topped with 3 inches of gravel. 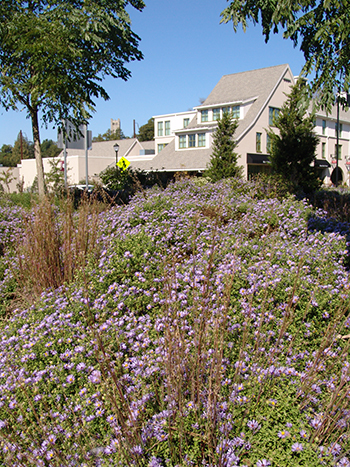 As noted in earlier posts, this creates a harsh environment for weeds to grow, while nurturing the planted material. Once the gravel was in placed, planting could begin. After two years, we have learned some lessons and hope to continue to improve. Some Coreopsis and Geranium were lost, as they were planted in a small liner size. Thus, we’ve learned to ideally use plants in the 21 size (21 plugs per flat). We also lost a juniper because a vehicle drove through the circle overnight. While we can replace the tree, the perennials are easier to replace as drive error will occur around the circle at times. Finally, we will be tweaking the plant selections in the circle as the plants evolve. 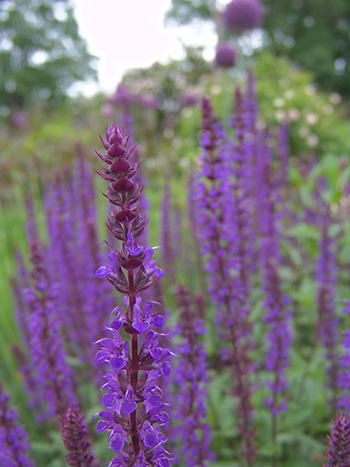 For example, we will be adding Salvia nemorosa ‘Caradonna’ for the deep purple color. The Salvia x sylvestris ‘Blauhügel’ currently in the circle is a light purple and the Caradonna will give a nice contrast. 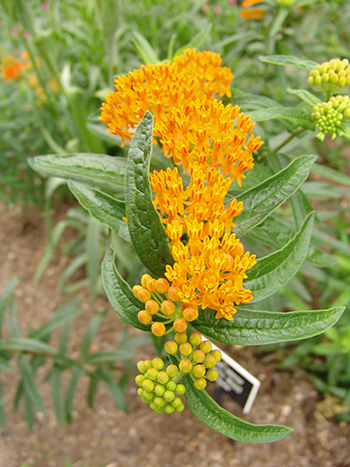 We will also be adding Aslepias tuberosa, butterfly weed, to the planting. This would expand the season of color in the garden and provide habitat for butterflies and caterpillars. Adjustments are good practice to improve and maintain a garden. 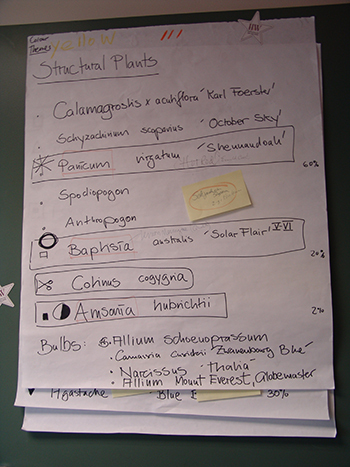 Consider your latest planting and evaluate its successes and failures throughout the seasons. Explore adding more color and varying the color to increase your impact. Fascinating! 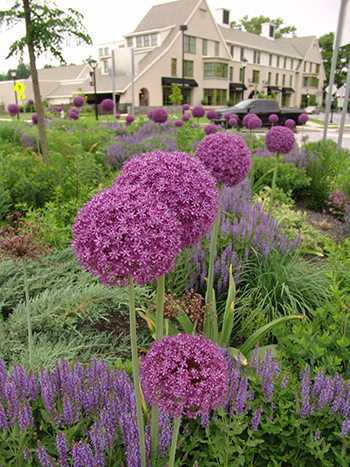 The purple aliums were a real showstopper this summer! Thank you Lynn. We love them too. I believe Jeff is talking about adding even more to the planting.